When my friend and award-winning author Ken Pelham, told me he wanted to assemble a collection of short stories for a modern horror anthology, I told him to count me in. Of course, I don’t regularly write horror stories (and don’t let me hear any cracks about my “horrible” stories), but I had written a few unsettling ones that I thought might work. After Ken said he’d accept previously published stories, I submitted Texting April, a tale of technology pushed past the limits of natural law into the supernatural world when young Nick receives a text message from someone who is no longer among the living. Texting April went on to win a Royal Palm Literary Award and was later published in my short story collection, Ghostly Whispers, Secret Voices. My story was accepted and Texting April is now one of twelve outstanding stories by thirteen writers: Elle Andrews Patt, Daco Auffenorde & Robert Rotstein (writing as coauthors), Bria Burton, MJ Carlson, Charles A Cornell, John Hope, Jade Kerrion, William Burton McCormick, Ken Pelham, Michael Sears, and Melanie Terry Griffey. 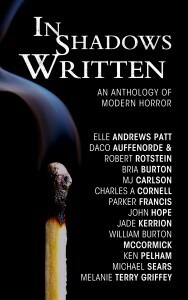 The anthology is titled In Shadows Written: An Anthology of Modern Horror. In his introduction to the book, Ken talks about our prehistoric ancestors sitting around campfires telling stories of the scary, dangerous world they lived in; a world filled with real monsters and unexplained mysteries. These were the first horror stories. You’ll find both monsters and mysteries In Shadows Written, as well as a fresh take on the monsters in our heads. So, as Ken says, before you sit down to read this collection of unnerving stories, make sure your light bill has been paid and all the doors and windows are locked.